A climber’s natural intoxicant, the Andes of Peru are the highest, most glaciated tropical mountains in the world. The famed Cordillera Blanca (white range) contains stunning climbs proudly cherished by the mountaineering community. Peru has long been a climber’s magnet, as the challenges are vast, demanding and ever-changing. 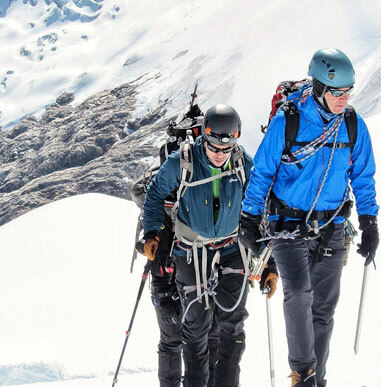 This program is highly recommended for those who want to improve their climbing level and look for a stepping stone to Himalayan expeditions by giving climbers the opportunity to climb over 20,000 feet. The climbs in Peru are currently led by one of our finest guides, Jose Luis Peralvo. Jose Luis has personally honed the itinerary for intermediate yet challenging ascents. While many companies have discontinued their Peru programs (As Huascaran, the highest peak in Peru, has not been climbable recently) we find the environment even more enticing giving the choice climbing in the region. Our main objectives are Pisco Oeste (18,872 ft.) and Ishinca (18,138 ft.) as well as Urus Este (17,782 ft). Following these climbs, we will try the mammoth Chopicalqui (20,847 ft.) As one of Peru’s tallest peaks, Chopicalqui offers a striking high-altitude ascent. The last three years were fantastic seasons with 100% success on Chopicalqui in 2015 and near the same in 2016 and 2017. (see last year’s climb) In addition to leading several successful expeditions, Jose Luis made some itinerary and logistics improvements in our continued efforts to fine-tune our program. We look for similar success in 2018 with Jose Luis at the helm. As always, we highly encourage you to contact former climbers for their perspectives as each had much praise about both the climbing arena and guiding. Climbers should have successfully completed our 6 Day Training course or have equivalent skills and experience. Climbers must have additional high altitude mountaineering experience and good knowledge of progression on snow and ice, self arrest, crevasse rescue and glacier travel. Climbers must be comfortable with progressing on snow and ice slopes of 45 degrees and exposed ridges. The routes may have short steep sections of up to 55 degrees on snow or ice. The requirements are also based on our desire to have similarly skilled team members. Please note the option to climb 3 of 4 peaks with early departure noting the 4th peak Chopicalqui the most demanding of the climbs. Climbers should have successfully completed our 6 Day Training course or have equivalent skills and experience. Climbers must have additional high altitude mountaineering experience and good knowledge of progression on snow and ice, self arrest, crevasse rescue and glacier travel. Climbers must be comfortable with progressing on snow and ice slopes of 45 degrees and exposed ridges. The routes may have short steep sections of up to 55 degrees on snow or ice. The requirements are also based on our desire to have similarly skilled team members. Climbers must be in very good to excellent physical condition. 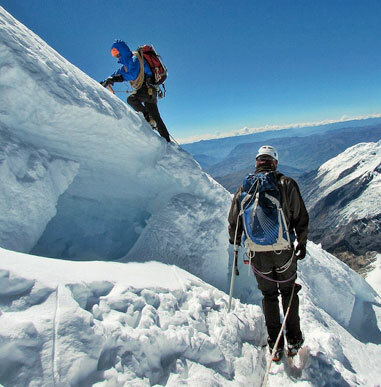 Summit day can be 12-14 hours long on Pisco Oeste and Huascaran. Along with the required crampon skills, review the training page of our web site. 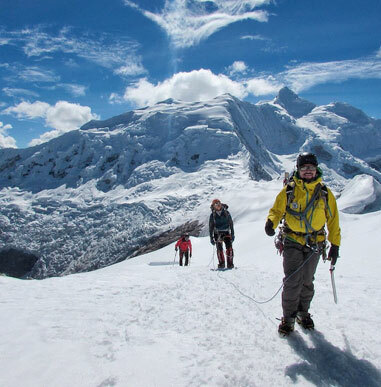 Our itinerary provides a fair amount of time to acclimatize before attempting Huascaran . We strongly recommend following the advice of our guides to acclimatize properly. Try to improve your cramponing skills to comfortably climb hard-snow slopes of up to 45-55 degrees. Your expedition leader will be Jose Luis Perlvo. He will have along as many assistant guides as necessary to ensure a low climber to guide ratio. The season for climbing in the Peruvian White Range goes from mid-May to mid-September, July is considered the best month of the dry season for mountaineering. Apart from a couple of nights that we will spend in the Huascaran hut, you will be sharing a tent along the expedition. Besides, there will be a couple of big tents at base camp for dinning and cooking. During the approach to base camps, acclimatization hikes, moving from Camp 1 up to Camp 2 on Huascaran and on summit day climbers will carry approximately 20 pounds. Climbers must be prepared to carry 40-50 pounds moving from base camps up to high camp on Pisco Oeste and from base camp up to Refugio Huascaran and Camp 1 on Huascaran. There will be bottled water available while staying in Huaraz. All water will be boiled while the group is in the mountains. Doing so for several minutes will kill anything that can live at the altitude the camps are located. You may bring power bars, Gu, Power Gel, cereal bars or similar high energy foods, powder Gatorade is also recommended to fight dehydration. All meals will be provided on this expedition. Most climbers arrive on the American Airlines, Continental Airlines, Lan Chile and TACA flights. Climbers that arrive early or depart late will incur in an additional airport pick up fee. The Lima airport departure tax is $25.00 U.S. Dollars payable in Dollars or Soles (the Peruvian Currency). Cash and travelers checks are accepted not credit cards. Tourists from the United States , Canada , New Zealand Australia and most of the European countries do not require visas but they must have a valid passport with at least six months of validity left. The personnel at Immigrations at the airport in Lima will give you a 90-day tourist visa upon your arrival. Please do not lose the tourist card, a sheet of paper that they will give you which you have to return to them before you take your flight back home or your departure can be delayed. In Lima and Huaraz telephones are readily available. Our guides will carry cellular phones in the mountains. The quality of the reception varies a lot from mountain to mountain and is generally not good. The best way to communicate to Huaraz is using the radios in the Pisco and Huascaran huts. Check the reading list on the Ecuador page of the web site. You can always call our offices and we will have our lead guide contact you. 30 days prior to departure, we will mail a list of the other team members to you. Communication is sometimes difficult in the Peruvian mountains. However our guides and local staff will make every effort to obtain the necessary transportation and reservations to get you home as quickly as possible if for any reason you need to depart early.